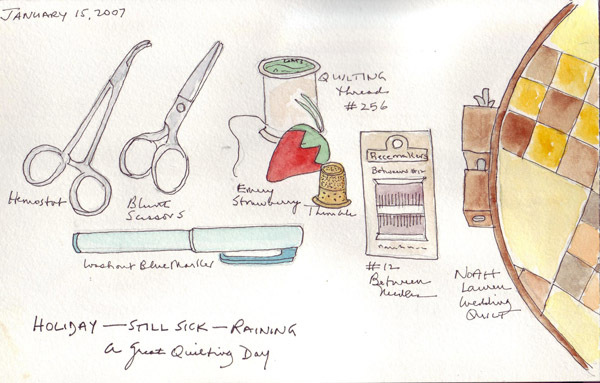 Several weeks ago I sketched my quilting supplies and a quilt that I was working on while too sick to be more active. 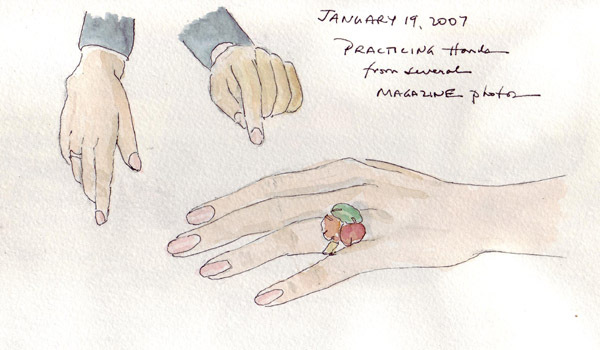 In this sketch I included my cute little blunt-nose Gingher scissors. When air travel restrictions were relaxed and these scissors were allowed on airplanes in the US, I was horrified to lose a pair while passing through security at DeGaulle Airport in Paris. The gendarme didn't say a word, he just reached over and dropped them into a plexiglass box full of confiscated items. Strange that nothing was said on the prior trip through DeGaulle in the other direction. These are the scissors that I drew for the EDM Challenge - 26 years old and still perfect. I first learned about Gingher scissors when I started quilting and now have the above 8" shears, 2 pair of small embroidery scissors, 1 pair of the craft scissors, 1 pair of pinking shears, 1 pair of applique scissors (which I don't use), one pair of clippers, and 2 pairs of the blunt-nosed scissors sketched above. It took awhile to convince my family that all of these were fabric-only scissors, but they have all survived and perfomed quite well. I think this qualifies as a Gingher collection! 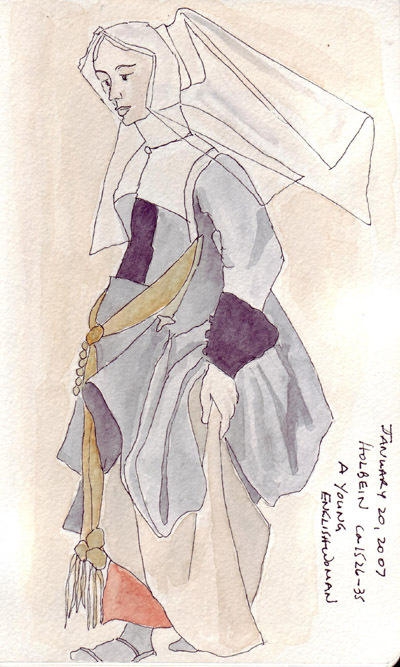 I loved the Holbein in England exhibit at Tate Britain and decided that he would be one of the Masters who I copied periodically to learn more about his methods of drawing faces and figures. 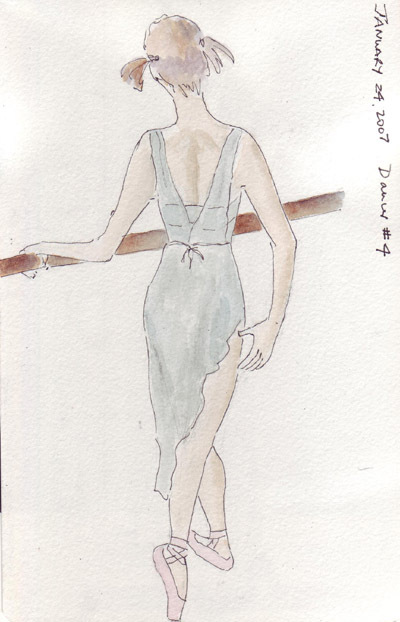 This is one of the few full length drawings, most of the others were only portraits. I am struggling to draw occasional people when sitting in public places, but usually the seats are so close together that I'm intimidated. 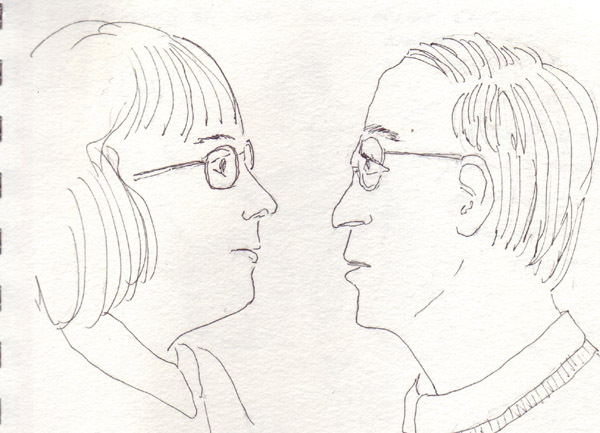 On Tuesday, during lunch at the Morgan Cafe in the Morgan Library and Museum, I had a leisurely lunch and was able to spend a few minutes after I ate making a quick sketch of a husband and wife who were facing each other at a small table approximately 10 feet away. This is a huge breakthrough for me. 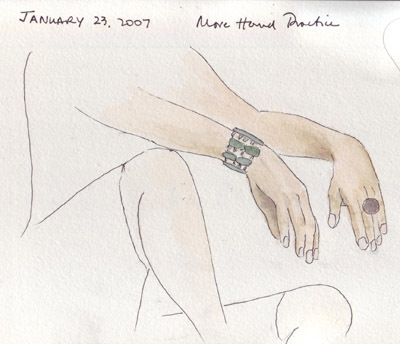 I have no problem sketching inanimate or non-human subjects in public. Maybe now I'll slowly build up confidence to draw people! I sat in the back row yesterday, in a corner of the auditorium, listening to the medical school Dean give a lecture. 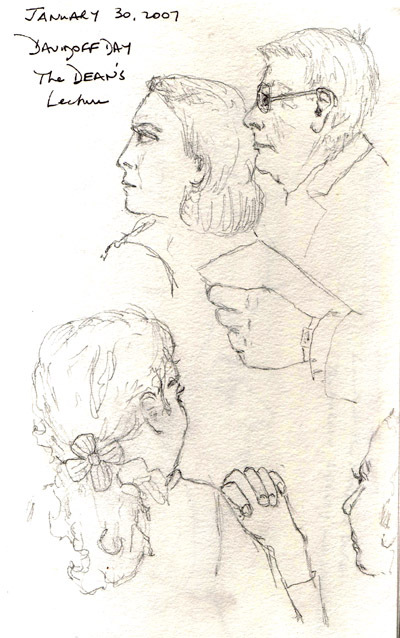 I was able to sketch several audience members during the lecture without being detected (or at least not confronted). I'm determined to keep sketching people but rarely find an opportunity. I'm not a Starbuck's fan, don't commute on trains, subways, or buses, and usually attend very small meetings. I increased the contrast on this scan to bring out the pencil sketches - accounting for the brown smudges over the page. It is not a sepia watercolor wash! In our kitchen we use a glass cannister of Kosher salt and a pepper mill to season food - and really don't have specific S and P shakers that we use during daily meals. However, my daughter gave me a set of miniature salt and pepper shakers that we put out on the dining room table when we have a group dinner - especially on holidays. Roz told someone in the EDM group that she has calligraphic gold gouache in her watercolor palette and I thought this was a great excuse to buy a tube of glittery gold for myself. 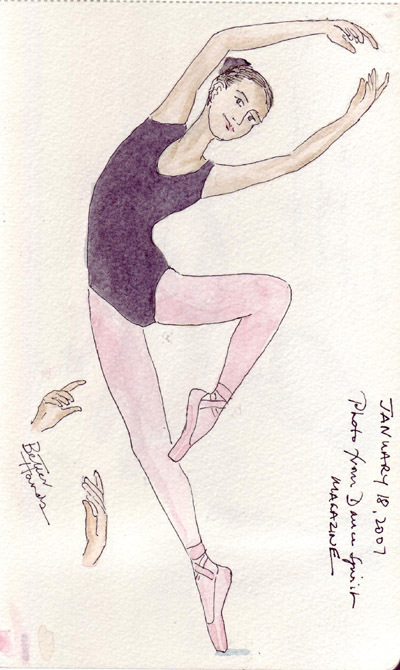 My local art store only had Winsor-Newton, not the Daniel Smith color that Roz has. You can't see it on the scan, but these tops really glitter as you move the page around. The darker color is the gold. The lighter color is Winsor lemon that I added for the light reflection. I love the effect of the sparkles!! I'm such a novice with watercolors, that I am simultaneously trying to work with skin tones and shading so these sketches in my large watercolor Moleskine serve two purposes. My husband and I watch the Lehrer News Hour each night after I come home from work and that hour was a perfect time for one of these journal pages. I could listen, but not really watch the speakers. And then I had the rest of the evening to hand quilt a wedding quilt that is overdue (My oldest son was married in July 2004)! Too many baby quilts for my grandchildren kept getting in the way and I still have a wedding quilt for my other son who married in Oct 2005 on my list to be quilted. The background on the pages looks muddier than in real life. I suspect that my scanner is picking up pencil that was used and poorly erased. 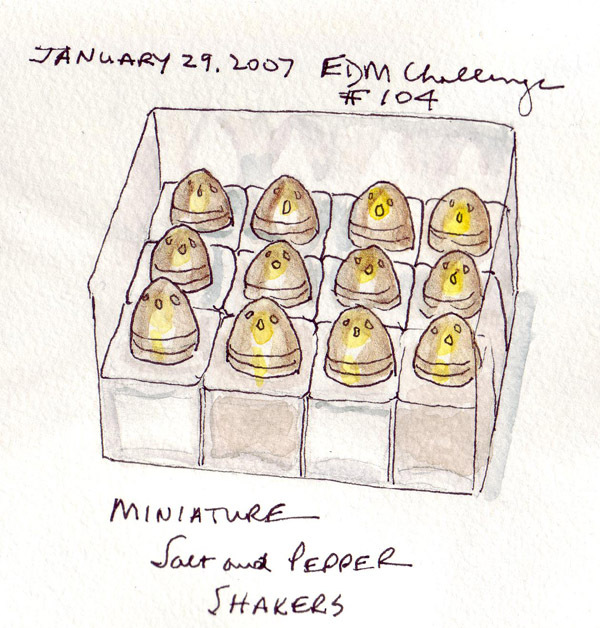 I am one of the EDM group that does a quick preliminary sketch in pencil. Otherwise I don't think I would be able to make these learning experiences.